Recipients of the 2014–2015 Dr. Muriel A. Howard Presidential Award for the Promotion of Equity and Campus Diversity were recognized at a ceremony held on campus April 7. Introductions were offered by Jennifer Hunt, co-chair of the President’s Council on Equity and Campus Diversity, associate professor of psychology, and coordinator of the women and gender studies program. President Conway-Turner honored three faculty members, a special program, nine minigrant recipients, and other supportive guests at the annual event. 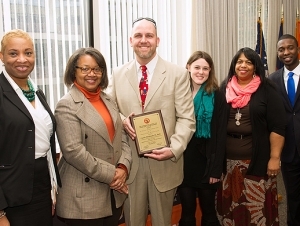 The award recognizes faculty and staff members who promote respect for diversity and individual differences through classroom discussions, curricular experiences, out-of-classroom activities, projects, conversations, or special mentorships that go beyond what is usually expected as a part of their regular job expectations or teaching assignments. Nominations were submitted by students, faculty, and staff to acknowledge members of the campus community who reflect these values of respect for diversity and advocacy for social justice. This year’s Muriel A. Howard Award faculty recipients were Pixita del Prado Hill, professor of elementary education and reading; Camilo Maldonado III, assistant professor of speech-language pathology; and Jennifer Ryan, associate professor of English. The Buffalo Beginnings Program, a program jointly run by Buffalo State’s Community Academic Center and Journey’s End Refugee Services which helps newcomer-refugee-youth adjust to the Buffalo school system and their new lives in Buffalo, received the Special Program Recognition Award. Minigrant recipients included “AFP 2014: Change through Stories,” Drew Kahn, professor of theater; “New World, New Wardrobe,” KeunYoung “Vicky” Oh, associate professor of fashion and textile technology; “7 Cajas (7 Boxes) Film,” Bridget Chesterton, associate professor of history and social studies education; “The Kenneth Thompkins’ Master Class and Lecture,” Rick Fleming, associate professor of music; “I Heart Consent,” Allison Hyman, undergraduate student; “The Misappropriation of History: West African Soldiers and Wives in France’s Colonization of Morocco, 1908-1918,” Kenneth Orosz, associate professor of history and social studies education; “Second annual ‘Women of the Guitar’ Festival,” Brian Geary, undergraduate student; “Changing the Frame and the Narrative of United States History” and “Why I am not Charlie: What can we learn from the attack on the satirical newspaper Charlie Hebdo about the situation of Muslims in France?,” John Abromeit, associate professor of history and social studies education. “Our gratitude extends especially to the faithful members of the President’s Council on Equity and Campus Diversity for their generous counsel and diligent work toward our mutual goal of equity and inclusion at Buffalo State College,” said Karen Clinton Jones, chief diversity officer. Download ceremony program and read nominators’ remarks. Pictured (left to right): Karen Clinton Jones, chief diversity officer; President Katherine Conway-Turner; Camilo Maldonado III, assistant professor of speech-language pathology; Alyssa Mazzarella, senior speech-language pathology student; Constance Qualls, chair and professor of speech-language pathology; Muhammed Sumbundu, member of President’s Council on Equity and Campus Diversity and College Council student representative.